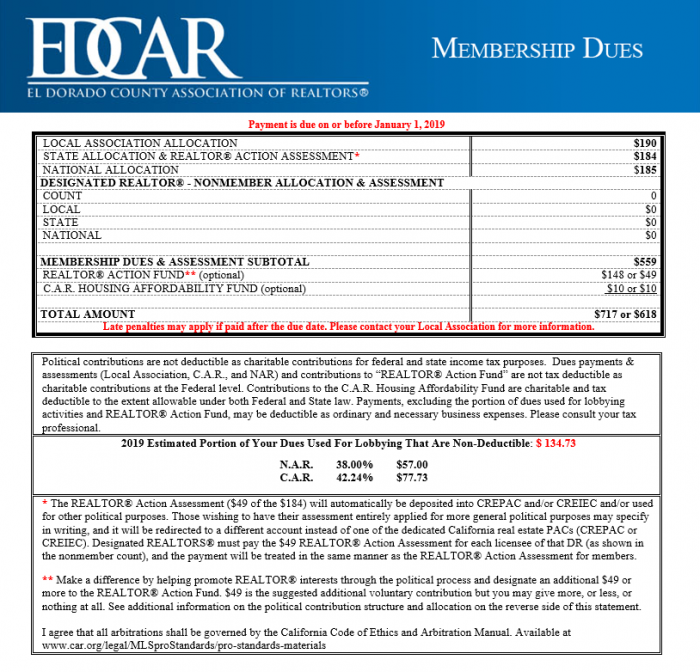 Click Here to View 2019 Legal Notices and Disclosures Regarding Dues Billing Statement Pay your 2019 NAR, CAR, and EDCAR board dues. By paying your dues online you agree that you have reviewed your membership statement. If you have any questions regarding your payment please contact the association. Below you will see options to contribute to the R.A.F (Realtor Action Fund) and the C.A.R. Housing Affordability Fund. Any contribution you are willing to give is greatly appreciated. A late fee of $55 has been assessed. To avoid suspension please pay your dues prior to February 15th. Please Note: You do NOT need to login to pay your dues. Simply enter your name and DRE license # in the fields below, then click "Add To Cart", then "Checkout" on the following page.